Saudi Clown Prince (and de facto King) Muhammad bin Salman is welcomed by British Prime Minister Theresa May on the first day of his three-day visit to the UK, 3-7-2018. Nobody was fooled by the war criminal’s Madison Avenue choreographed charm offensive, as it sparked more controversy than anything else and put Britain’s chief executives on the hot seat as they are subsidizing the prince’s genocide of the Yemeni people with the latest high-tech weapons. 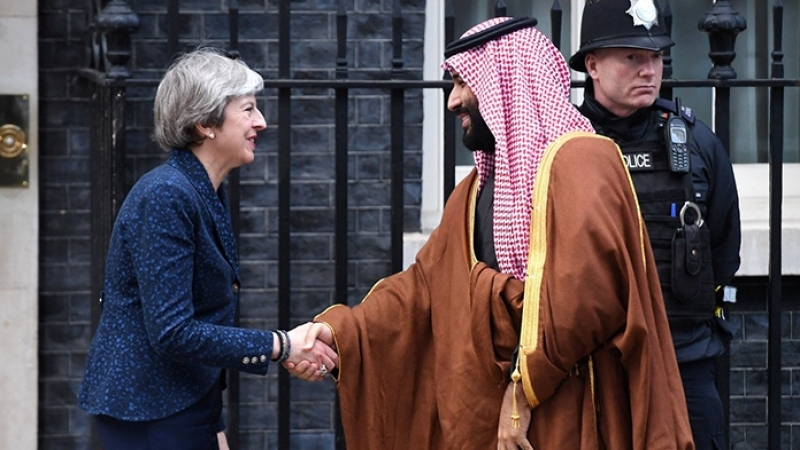 Not too many months ago, shaking hands with a woman was considered to be sacrilege by the facial-hair establishmentarians and trouser-length afficionados of takfiri-Wahhabi Arabia. Now, he says that this departure from Islamic “moderation,” which according to the prince’s view of Saudi history has been the true nature of the puritanical Kingdom all along, is attributable to the extremist influence of the Muslim Brotherhood. It was supposed to be a triumphal tour. 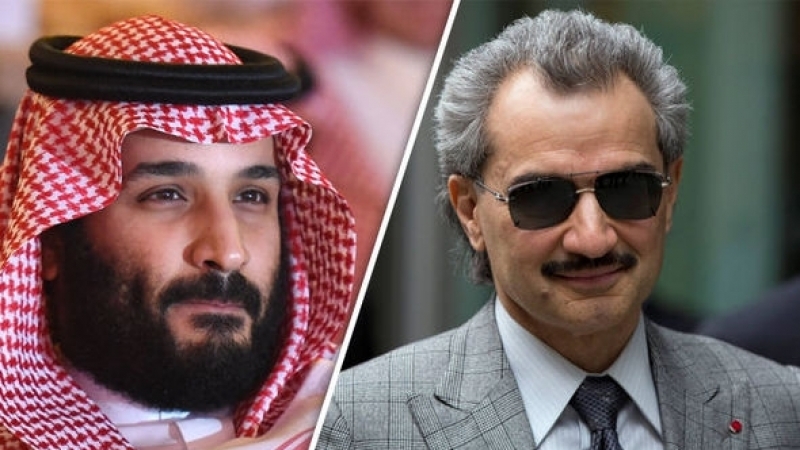 Muhammad bin Salman, the Crown Prince and de facto despot of “Saudi” Arabia, spent vast sums of money stolen from his people to splatter London with gigantic images of his own pompously grinning face. Billboards and circulating panel trucks vaunted his vivacious visage, singing the young prince’s praises, offering him warm words of welcome, and suggesting that Riyadh would be the perfect place for British investments. The irony of Bin Salman paying for his own welcome messages — in effect, spending millions of Euros to welcome himself to London — struck some observers as pathetic, others as hilarious. The Saudis have always been the stupidest people in the world with money, and Bin Salman seems to be outdoing his elders at least in this regard. But will such lavish displays really convince the City of London to bail out the bankrupt Saudis from the hole they have dug for themselves in Yemen? Will hard-headed bankers and businesspeople, gazing at the sorry spectacle of BS throwing his unearned money around like an idiot while creating the worst humanitarian catastrophe on the planet, really decide that it’s time to reverse the flow of the world’s biggest financial current, and pump wealth into “Saudi” Arabia rather than out of it? That prospect is about as likely as reversing the flow of the Amazon. This is the first time a Saudi ruler has ever taken a trip hat in hand, begging for cash. Until now, the Saudis always dished out vast sums wherever they went. But today the Kingdom is going broke, thanks to BS’ monumental blunder in Yemen. That billion-dollar-a-day Saudi-inflicted genocide couldn’t have come at a more inopportune moment: the new era of low oil prices cooked up by the Anglo-Zionist empire’s plunge protection team, using financial chicanery and unsustainable shale oil mining to target Iran, Russia, and Venezuela. 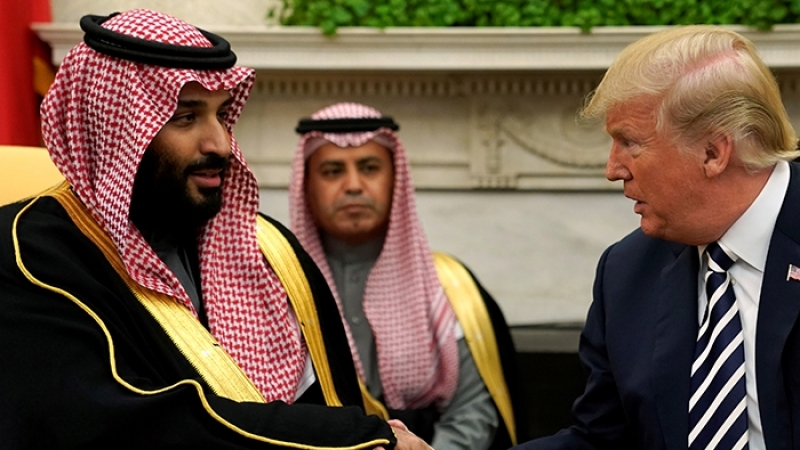 In a monumental case of blowback, the Empire’s own oil spigot, the Saudi regime, is suffering worse collateral damage than the intended targets of the PPT oil-price-collapse operation. But unlike Maduro, who has created the Venezuelan Petro — a new crypto-currency backed by Venezuela’s vast oil reserves — Bin Salman, enslaved to the Rothschild petrodollar, has no choice but to grovel before his Western masters begging for vast sums of money that are unlikely to ever materialize. 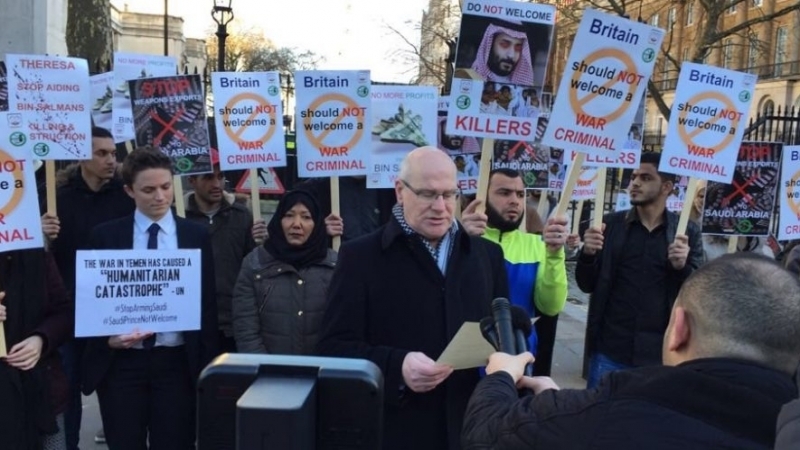 After three days of high level meetings marred by protests, the harvest of mainstream media headlines was hardly what the clown prince intended, “Saudi prince Mohammed bin Salman can expect angry protest mob at Downing Street” (The Times); “Why Mohammed bin Salman’s Visit to London was a Fiasco” (Middle Eastern Eye); “Hundreds Gather Outside Downing Street to Protest Against Crown Prince’s State Visit” (The Independent); “Saudi crown prince’s visit to London turns into a bitter and awkward PR battle about his policies” (The Washington Post); “For a Change, Saudi Arabia Is Begging for Money” (Haaretz); “Saudi Crown Prince’s UK Visit Prompts Heavy Criticism” (The Guardian); “Ad blitz masks unease over Saudi prince’s visit to UK” (Financial Times); “PM raises human rights concerns in Saudi crown prince visit” (BBC); and “‘Bizarre’ PR drive launched by Saudi Crown Prince” (The Independent). Following his disastrous UK tour, Mr. Royal BS fled with his tail between his legs across the Atlantic. Arriving in Washington, DC on March 19, he met with his egomaniacal American counterpart Donald Trump, with New York — and Zionist crime kingpin buddy Jared Kushner — next on the itinerary. While Bin Salman’s crude Machiavellian ruthlessness seems to have served him well in his climb to the top of the Saudi power pyramid (over the bodies and fortunes of his peers) the same gangster mentality may not serve him well in his attempt to trick the US into bailing out his bankrupt kingdom. Though BS seems to think his close ties to the President’s kosher nostra son-in-law Kushner are his biggest asset, they will almost certainly turn out to be an even bigger liability. All available evidence indicates that Kushner, a prime target of more than one federal investigation, will be increasingly sidelined from power, and may even be headed for prison, following in the footsteps of his crime capo father. Kushner’s real estate and suspected money laundering empire, like Bin Salman’s oil empire, is staring bankruptcy in the face, thanks to the worst investment in the history of real estate: 666 Fifth Avenue. Kushner bought the satanically-numbered building shortly before the 2008 collapse, took out huge loans with a ten-year due date to cover the losses, and is now scrambling to find a way to pay the piper. In a comic folie-à-deux, Kushner and BS each thinks the other can bail him out. More likely they will both go down together. Kushner is also the key figure in the risible Trump-Bin Salman “Mideast peace plan.” Of all of BS’ many missteps, the biggest may be his monumentally foolish embrace of the Trump-Kushner scheme to forcibly impose “Mideast peace” by unilaterally handing Jerusalem (al-Quds) to the Zionists. Since Trump-Kushner announced their impending move of the US embassy to colonized al-Quds, the Palestinians — along with all other legitimately interested parties, including the world’s 1.8 billion Muslims — have permanently rejected the US as a broker. Even Mahmoud Abbas, not previously known for biting the hand that feeds him, has lashed out at the US and called its ultra-Zionist ambassador David Friedman a “son of a dog.” Obviously this “peace plan” is going nowhere. Like all of BS’ rash moves, including his war on Syria, attack on Yemen, blockade of Qatar, and kidnapping of Lebanese PM Hariri, the peace-through-Kushner effort was a predictable train wreck from the get-go. BS says “only death” can stop him — meaning he will never give up his absolute power by peaceful means. But regardless of whether the young autocrat goes into exile, prison, or the grave, the demise of his autocracy is easily predictable. What is less predictable is whether the Anglo-Zionist empire will bother making heroic efforts to delay the inevitable.